Online gaming fans are to be recruited by Scotland’s national museum to harness their technical skills to help piece together more than 3,000 recently discovered fragments depicting the Cross on a Pictish slab. The project, the first of its kind in the archaeological world, will see participants use a unique 3D programme developed by a Scottish technology firm to try to solve the mystery of the Hilton of Cadboll Stone. Computer experts believe people who play computer games are more adept at manipulating objects on screen. Nasa has already made use of citizen astronomers who use home computers to sift through time-lapsed data from the Kepler space telescope to search for habitable exo-planets, planets outside the solar system. The stone, which stood on a chapel site in Tain in Easter Ross was carved around 800AD, after the Picts converted to Christianity, in order to celebrate their new religion. Over the centuries the stone, now located in the National Museums Scotland in Edinburgh, suffered a number of accidents. At some point it was knocked over and broken, possibly in a storm, and the bottom portion was lost. It is also believed to have been vandalised more than once during the time of the Reformation in the 16th century. In 1676 the original carving of the Christian cross was chipped off and replaced with an inscription commemorating a local man, Alexander Duff, and his three wives. Recent excavations of the chapel site uncovered the upright base in the ground and more than 3,000 scattered fragments of the face of a cross. A major new exhibition Creative Spirit: Revealing Early Medieval Scotland starts at the museum on 25 October where some of the newly discovered fragments will be displayed. Archaeologists hope gamers will be able to piece together the jigsaw to give experts a chance to interpret and decipher the stone’s elaborate symbols and carvings. Mhairi Maxwell of the NMS said an appeal would shortly be issued to online gamers and that their help was vital due to the enormity of the task. She said there had been one previous attempt to piece all the fragments together but that it soon became obvious that such a task needed manpower and specialist skills – now possible due to new computer technology. “It is a task much larger than one person. If we can do this it will be a huge step forward in our understanding and could change what we know about this stone. “Archeologists are always working with fragments, but it is extremely rare to find over 3,000 fragments at the base where the stone originally stood. The fragments range in size from small pieces of 3cm diameter to big chunks which are 15cm to 20cm in length. Maxwell added that archaeologists had only “half the picture” of the stone’s history. Last year research on the other side of the stone revealed that its main figure was one of Scotland’s earliest depictions of Jesus. 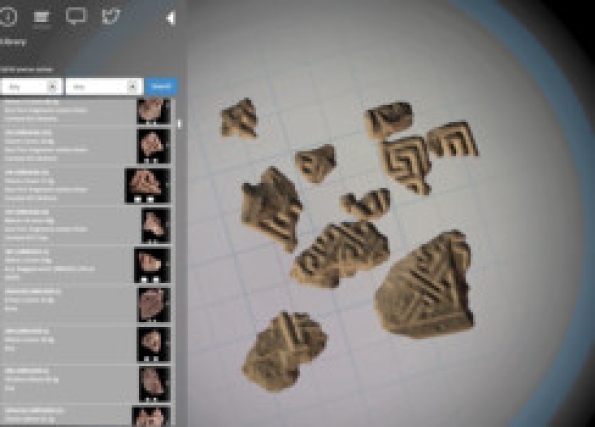 Aegir Maciver, director of Peebles-based Relicarte, which developed the platform for online gamers, said the stone’s precious fragments were transported at night to Borders General Hospital, placed in trays and put through a CT scanner, which digitised the fragments and reproduced them as 3D objects. The task, which took two nights to complete, also involved the laborious business of labelling each individual fragment. “We had already been doing some work at the museum and we were told they were about to undertake the Cadboll Stone project and intended to have a digital aspect too and asked us to come up with ideas,” Maciver said. “We created an online software platform which allows you to view and manipulate files. Maciver continued: “It’s very innovative and allows people who don’t have powerful computers or 3D software to go online and interact with 3D models in real time. The Glenmorangie Company’s whisky distillery is near the chapel site and is now in its sixth year of sponsoring the museum’s Glenmorangie Research Project on Early Historic Scotland. Hamish Torrie, brands director of the company which uses a design from the lower half of the stone as the logo for its single malts, said: “It’s great that modern technology can be used to piece together the mysteries of the past. Creative Spirit: Revealing Early Medieval Scotland will be on show at National Museums Scotland from 25 October to 23 February.